SUMMIT COUNTY – Jay Bauer was a witty, upbeat attorney of impeccable character who left a powerful impression on Summit County. “It’s one of those personages that no one will ever quite duplicate,” said John Farr, a friend and former resident. Bauer, 65, died Monday night after battling cancer for more than two years. He left quite a legacy behind. The road signs welcoming motorists to “Colorado’s Playground” were one of his marks, as are events surrounding the annual Rotary Ice Melt Contest and the language of a successful open-space ballot initiative in Breckenridge. Bauer’s community involvement ranged from volunteering with the Rotary Club and helping foster economic development to emceeing events and auctions, and more. Bauer, Farr and former Sheriff Delbert Ewoldt could be seen selling Rocky Mountain oysters during the summer’s Dillon Barbecue as recently as last year. Friends and family said Bauer was always trying something new. 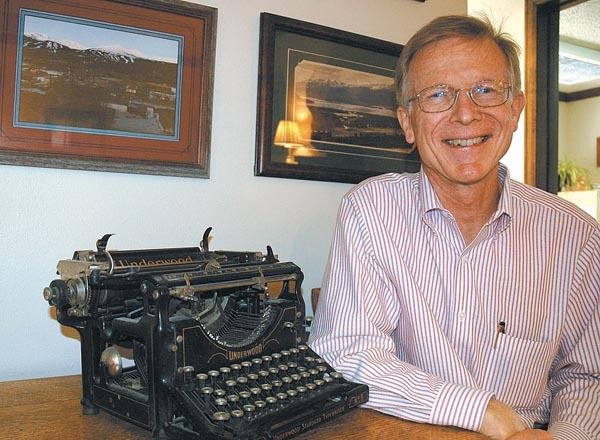 Born in Chicago and raised on the Front Range, Jay Bauer moved to Summit County in 1973 after graduating law school from the University of Colorado at Boulder. He was drafted during the Vietnam conflict and reached the rank of first lieutenant, Bly said. Farr said Bauer wasn’t sure where to go after law school, but that he convinced Bauer of the opportunities in Summit. “He wasn’t a mountain man or skier or outdoorsman. He was a people person,” Farr said. But it wasn’t long before Bauer was heavily involved in the county. Jay Bauer tried running for county commissioner and lost. Bly said he wasn’t elusive enough and would tell people exactly what he thought. Law partner Jeffrey Burns said Bauer’s expertise was in real estate law, and he was a faculty member of the Colorado Association of Realtors. Breckenridge Councilman Jeffrey Bergeron said he was surprised when Bauer turned down money for helping drafting a successful ballot initiative for open space. Former Frisco Mayor Bernie Zurbriggen said Bauer’s involvement with Rotary led to the Ice Princess and Ice Ball as part of the Ice Melt Contest – an event now being copied by other Rotary clubs in the state. “It was just a whole lot of fun and it was just a part of his creativity that that came about,” he said. Local resident Peggy Long said Bauer was passionate when it came to emceeing local events. Chief District Court Judge Terry Ruckriegle said Bauer ran a “very efficient” practice and strived to save his clients money. Ruckriegle said he recalls Bauer telling him he was glad when the court began using an electronic filing system, even though many attorneys had objected to the transition. Former Summit County Commissioner Tom Long said Bauer “pioneered” an early electronic bulletin board system used locally before e-mail. “He was progressive as they come,” Long said of the fellow Republican. Friends said Bauer didn’t readily volunteer the state of his health, even in the last few months. He was diagnosed with cancer – and doctors said he had four months to live – more than two years ago. In an interview with the Summit Daily in February 2009, he said he was keeping himself busy checking off his “bucket list”: trekking through Bhutan, bicycling 700 miles of the Pacific Northwest and sightseeing in Washington, D.C. He would later take another bicycle trip, and in October he took a trip to the coast of Maine with his wife, Joni. Bly said other hobbies of Jay Bauer included collecting old maps, surveying land, framing pictures and listening to jazz music. “He was just a multifaceted person,” he said. Bauer also could sing and play guitar. But more than anything people mention when they mention Jay Bauer is his solicitude.